Garbage data comes to my socket using RS485 communication. Sometimes, garbage data comes to socket because of electrical NOISE in RS-485 communication. Usually, the RX LED for a serial port looks ON. In this case, we recommend you solve it referring to the recommended circuit below. It is a general RS-485 network. If you don’t connect signal ground, there will be some noises or the receiver might be broken because of voltage difference between two devices. If the voltage difference is under +200mV, the operation unpredictable. There might be some noise data during the idle state or during the data communication. Of course, the RS-485 driver has the “fail-safe” function for it. So the biasing resisters are needed for the RS-485 network. There is a ground interface in ezTCP but the 5V is not available for the biasing resistors. The biasing resistors can be at any points and only one pull-up and one pull-down resistors are enough. So you can place the resistors on the customer’s device side if a +5V pin is available. I recommend 680ohm or 560ohm for the biasing resistors but other values can be used if there is no termination resistor. If the value is becoming higher, the response time will get slower and the current will be decreased. On the other hand, if the value is becoming lower, the response time will get faster and the current will be increased. If the cable is long or the transmission speed is high, two termination resistors are needed because there will be data corruptions by reflection waves. 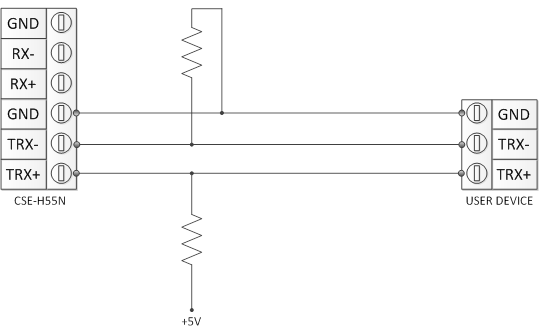 The termination resistors’ value should be the same to the cable’s characteristic impedance. Most cables’ characteristic impedances are 100 ohm or 120ohm. When you add only termination resistors without any biasing resistor, it might cause a problem. The usual termination resistances are 100 or 120 and there is internal pull-up resistance in the driver. So the differential voltage might be under +200mV, and it causes a problem. The resistance of the biasing resistors should be 560 ohm or 680 ohm in this case.